When it comes to (Fill in 1), many people still do not believe that the (Fill in 2) is real. When a child has a good ministry experience, he is more likely to (Fill in 3) in his faith and stay involved with the (Fill in 4). 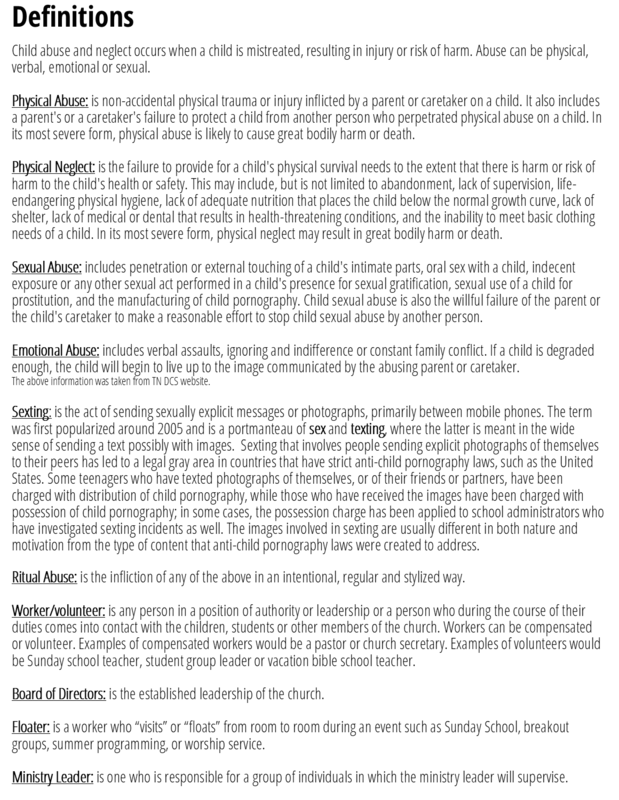 When a child is a victim of sexual abuse in a faith community, the (Fill In 5) are devastating and last the child's (Fill In 6). The three factors that determine the level of risk include (Fill in 7), (Fill in 8), and (Fill in 9). In the event, the next button does not work or is not visible, return to the questions above on this page. On question one, choose additional answers. On question two, change your answer. In the event, the next button does not work return to the question above to click on additional choices..
After submitting this training the option to download a copy of the Reducing The Risk Policy and Procedures will be available. We apologize for the small print on the training document. In the event, the next button does not work return to the question above to click on additional choices. Children and students crave the attention and appropriate touch from leaders within our church. We consider appropriate touch as giving high fives, giving fist bumps, giving a hug when it is wanted by the child or the leader asking permission. Never force a child to give a hug. Please ask if you have a specific question. Sitting in laps - We recommend children not sit in laps unless it is your child. Male leaders and all students should not allow students to sit in their lap. Instead, give the student an option sit next to you with their hand on your knee. Working with children who have special needs. Ridgedale has been blessed with several children who have additional requirements. If you have specific questions when working with our children, please see the Children's Director, the Captain, the Commander, or our Administrative and Family Pastor. We will be glad to answer any questions. 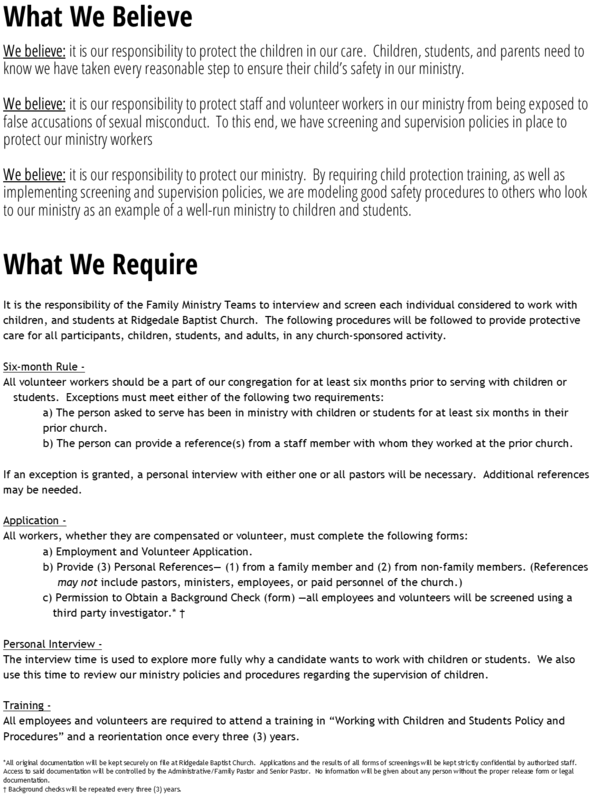 We require two adults to supervise any activities with children or students. Supervision Policies (#1) lists an exclusion and should be used only when necessary. Select the correct answer to advance. Students or children should never be alone with anyone. 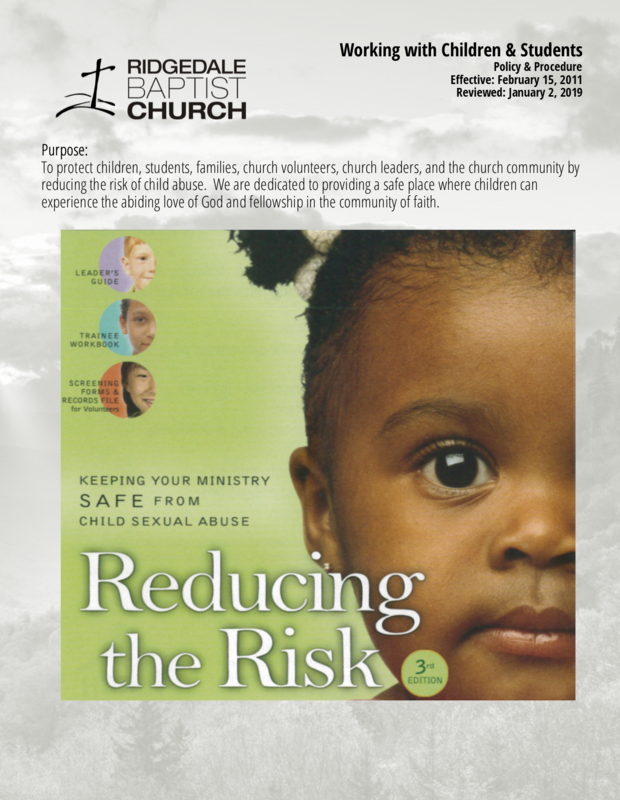 In the event this is witnessed, contact Pastors, Director, or a Leader immediately. Counseling or discipline is always in the open for others to see and hear. 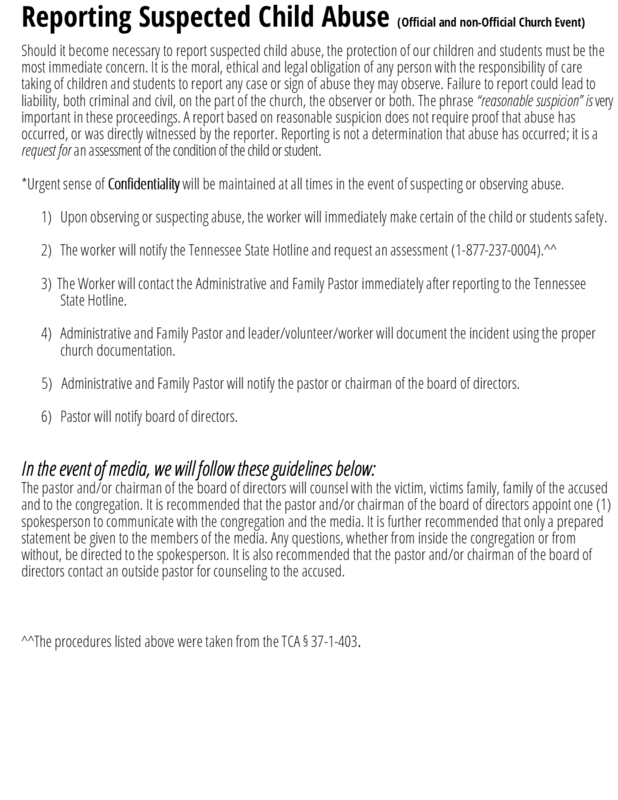 This is in place to protect our families from allegations. It is best for women to change diapers and assist children in the restroom. In the event, it is urgent for a child to use the bathroom a male or student should stand outside the restroom door listening to see if assistance is needed. If assistance is needed the male or student should seek help from a female. By typing your name, I have read and understood these Policies and Procedures. 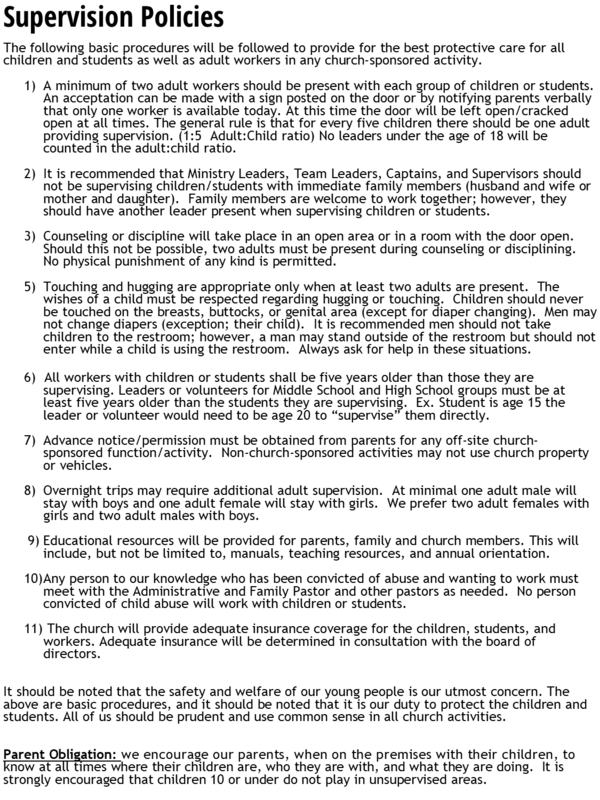 I will abide by them as a volunteer or paid employee of Ridgedale Baptist Church. I will report any abuse I see to the appropriate authorities and church administrator. Help us to improve our training.